Rear screen projection is the oldest speciality of Macada Innovision. This projection technique can be used almost everywhere. For example, at meetings, video-conferencing, symposia, lectures, exhibitions, theatre productions and sporting events. Rear screen projection is also ideal for mobile presentations, road-shows and outdoor advertising. What is rear screen projection? 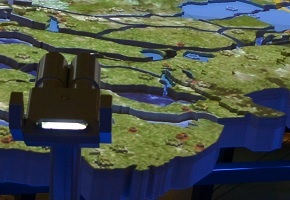 With rear screen projection, the projector (video, data, film) is placed behind the transparent screen and the viewer in front. There is ambient lighting in the area where the audio-visual presentation takes place. There is no need to dim the lights. 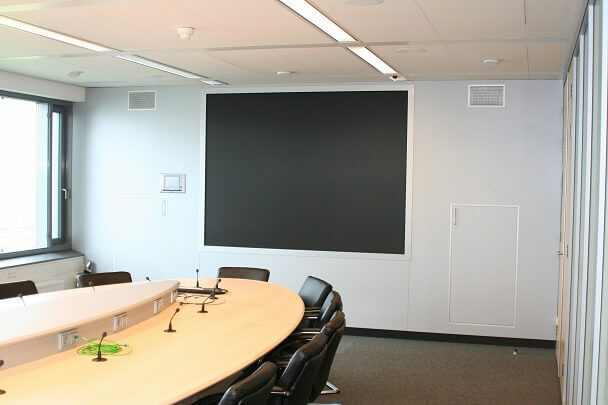 Choosing the right rear projection screen is all about the customer’s wishes, the available space, the structural situation and the type of projector. With this information, we develop a ‘recipe’ for the optimum rear projection screen. For example, a screen with higher contrast, darker acrylic or lower gain. Based on this recipe, we produce the appropriate rear projection screen ourselves. The substrate can be glass or acrylic. One or more projection layers are applied in order to achieve the desired material properties. More information? Read: Choosing a projection screen.